Back in December, FCPAméricas predicted that FCPA enforcement in 2015 will be “dynamic.” The $772 million settlement with Alstom, and the aggressive statements by FCPA enforcement officials seemed to foreshadow events in the next calendar year. Companies were warned about predicted trends, like more actions, individuals under the microscope, aggressive investigations – including wiretaps, body wires, border searches, physical surveillance, and other aggressive tools… these almost speak to a futuristic world where at every corner one is met with full armoured guards sporting a rather large looking weapon of mass destruction on his shoulder. Well, it’s been a busy January, February, and March of 2015. The foreshadowing Gods have not predicted wrong. 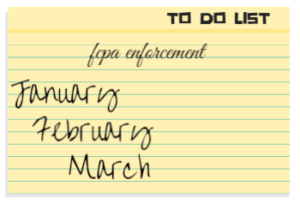 During the first calendar quarter, there were two corporate FCPA enforcement actions — both through SEC administrative orders — and one individual resolution. During the past quarter, Biomet’s three-year deferred prosecution was extended for a year. Two FCPA defendants from a Wall Street broker-dealer were sentence to four years in prison for FCPA and Travel Act offenses. There were four declinations, and a sentencing in a prosecution related to the Alstom enforcement action. Goodyear Tire & Rubber Co. (February 23) agreed to pay $16.2 million to settle SEC charges that subsidiaries in Kenya and Angola paid bribes to increase tire sales. The SEC said in an administrative order that Goodyear violated the books and records and internal controls provisions of the FCPA by failing to prevent more than $3.2 million in bribes from 2007 and 2011. The bribes went to employees of state-owned and private companies. PBSJ Corporation (January 21) agreed to pay $3.4 million to the SEC for violating the Foreign Corrupt Practices Act by paying bribes and employing foreign officials to win Qatari government contracts. Tampa-based PBSJ is now known as Atkins North America Holdings Corporation and no longer offers public stock in the U.S.
Walid Hatoum (January 21), a former international marketing director for PBSJ, agreed to pay a penalty of $50,000 to the SEC. The agency charged him with violating the FCPA’s anti-bribery, internal controls, and books and records provisions, and with false records offenses. Hatoum settled without admitting or denying the SEC’s findings. Benito Chinea (March 27), the former chief executive officer of New York-based Direct Access Partners LLC, was sentenced to four years in prison for bribing a Venezuela state bank official in return for bond trading business. He also forfeited $3.6 million. He had pleaded guilty to one count of conspiracy to violate the Foreign Corrupt Practices Act and the Travel Act. Joseph DeMeneses (March 27), Chinea’s co-defendant and a former managing director of Direct Access Partners, was sentenced to four years in prison after pleading guilty. He was ordered to forfeit nearly $2.7. Biomet Inc. (March 18) said in an SEC filing that the DOJ extended for another year its 2012 deferred prosecution agreement that was part of a 2012 FCPA enforcement action. The orthopedic device maker’s three-year DPA was set to expire on March 26. But the Indiana-based company self reported more possible FCPA violations in Brazil and Mexico that pre-dated the 2012 settlement. Eli Lilly (February 12) said the DOJ has closed its FCPA investigation of the company. In late 2012, Lilly resolved civil FCPA charges brought by the SEC. The company paid $29.4 million for offenses related to bribes to government officials in Russia, Brazil, China, and Poland. Lilly agreed to the settlement without admitting or denying the SEC’s allegations. The SEC launched its investigation in mid 2003. The DOJ later joined the investigation. 21st Century Fox Inc. and News Corp (February 2) said they won’t be prosecuted by the DOJ for hacking voice mails or making payments to public officials in the UK. News Corp spun off 21st Century Fox in 2013. Fox now holds the entertainment assets and News Corp holds the publishing assets. Cobalt International Energy, Inc. (January 29) said it received a termination letter from the SEC advising that the agency’s FCPA investigation relating to Cobalt’s operations in Angola has concluded and that the SEC staff doesn’t intend to recommend any enforcement action. Asem Elgawhary (March 23) of Potomac, Maryland was sentenced to 42 months in prison for taking $5.2 million in kickbacks to rig bids for state power contracts in Egypt. The ex-Bechtel Corporation vice president pleaded guilty in December 2014 to mail fraud, conspiracy to commit money laundering, obstruction, and interference with the administration of the tax laws. He took bribes from three power companies, including Alstom SA. In December 2014, Alstom paid $772 million in criminal fines for FCPA violations, including bribes to Algawhary. Phew! It’s enough to make one’s head spin. It’s enough to make the ethics and compliance department’s head spin. It’s pretty safe to say that bribery, corruption, and securities violations will never become extinct beasts. Companies will always have to be doing their due diligence to keep these brutes under safe and manageable wraps. Managing third party relationships is an ongoing process to effectively mitigate business risk. Companies need a strong technology platform to meet the most rigorous global compliance and regulatory standards to shield themselves, the board and senior management from allegations of bribery and corruption by third parties. Download a white paper on how due diligence plays a key role with anti-corruption compliance.